'Portable' operations is usually signified by amateur radio operators appending the suffix '/P' to their callsign. Operating '/P' normally means that stations are operating away from their licensed station address. A radio amateur carrying a hand-held radio is not a portable station lets say; in a city or in a country side. 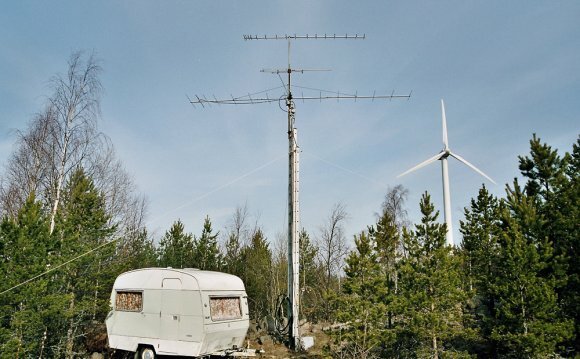 The advantages of /P operation include the use of large empty spaces where full size beam and wire antennas can be erected on tall trailer mounted masts. If operating on VHF/UHF, this can mean a location on the top of a hill or cliff, with clear line of sight to the horizon. The main disadvantage is normally the power supply available. As normal mains grid power is unavailable, the /P operator may have to resort to batteries, portable generators, solar panels". and wind turbines. Operating amateur radio at sea is known as 'Maritime Mobile', as is signified by the suffix '/MM' on the call. Operating amateur radio from a vehicle is known as 'Mobile', as is signified by the suffix '/M' on the call. Some countries allow the direct connection of amateur transceivers to telephone lines called "phone patching". Thus, a traveler may be able to call another amateur station and, via a phone patch, speak directly with someone else by telephone.